You will find many articles on the web showing the benefits of using multiple monitors to increase your productivity. So, I will not go deep into it. 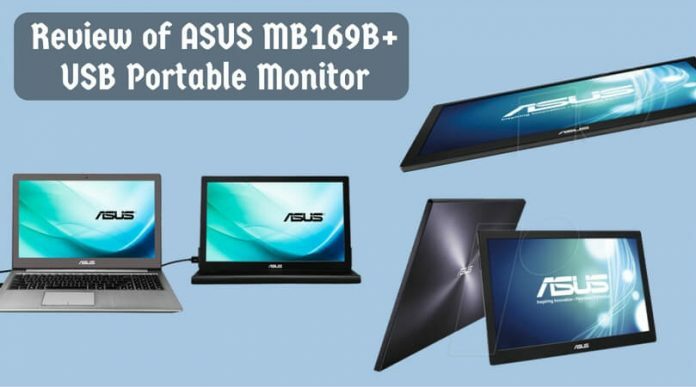 I am here today to provide you the review of ASUS MB169B+ USB portable monitor. FYI, till today, the best portable monitors come with the resolution of 1366x768Pixels. But, the ASUS MB169B+ has changed this by offering 1920x1080P resolution with its 15.6” screen. The ASUS MB169B+ has a dimension of 14.9×9.26×0.26 inches and a weight of only 1.6lbs. This specification makes it lighter and thinner than the AOC E1659FWU USB powered monitor. It does not have an arm like AOC has, though. This ASUS monitor requires a canvas carrying case of 1lb which can be folded over for mounting. It has an IPS panel technology which offers the best color response to the display. It has a better viewing angle and can switch quickly from portrait mode to landscape mode. The screen’s brightness also adjusts for both Mac and Windows. It has a metallic-colored plastic back, and the front and sides are made from a fine matte plastic. The power on/off button, brightness setter, and a single micro-USB 3.0 port; all these houses placed on the left side of the monitor. This portable monitor comes with an EZlink, Multiframe software, and a CD-ROM. 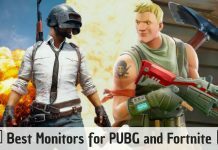 This software will help you to manage your Windows. You can also get the utilities from support.asus.com for the one without an optical drive. Like the most other portable monitors, the ASUS MB169B+ is also powered by a DisplayLink chip. After the successful installation of the needed drivers, you just need to plug in a micro USB cable into the monitor and your computer. The ASUS MB169B+ will light up and start working on your second screen. By providing wide viewing angles, the ASUS MB169B+ delivers bright images and natural colors. When I watched the 1080P video of “Avatar”, the images were accurate from up to 65 degrees right or left. The colors of ‘Jack Sully’ and ‘Neytiri’ were correct, but not the best, though. As the monitor uses a matte finish instead of glossy, you will see the reflections only when you go closer to 90 degrees. It is perfect for watching videos, and even better for the productivity work. It provides sharp and smooth images whatever content you see on it. Whether you are editing your Google Doc file or watching videos at HD 1080P resolution, it delivers smooth and perfect motion. I did not get any issues surfing the web or playing full HD videos on it. 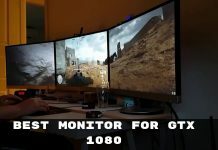 As per my test results, the ASUS MB169B+ monitor is the best portable monitor you can get in the recent times. The high-resolution screen helps you to become more productive on the go. 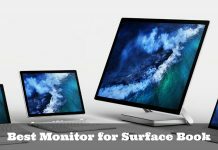 The accurate color response, faster performance, plenty of display area in a lightweight design, and an excellent portability; all these features makes the MB169B+ a worth monitor for its value.